Successful drug development requires anticipating safety and regulatory issues as early as possible. PharmaPendium is uniquely positioned to facilitate efficient translational studies of drug safety and efficacy. It supports risk assessment activities with unique access to valuable adverse event and approval documents alongside tools that maximise insights into drug safety and efficacy data. The 2018 development plan for PharmaPendium focused on strengthening this position as a support tool for early assessments of drug candidates. The webinar includes demonstrations of all the new features and a Q&A session for attendees to get further information about PharmaPendium’s drug safety and efficacy workflows. Information found in the biomedical literature is a significant source for every stage of the medical device life cycle, from concept and design through clinical trials to release and reimbursement, as well as post-market surveillance. In June 2016, the updated Medical Device Clinical Evaluation Report (CER) guidelines came into effect (Revision 4 of MEDDEV 2.7/1), detailing where and how to search for literature and how to record the process of collecting, appraising and analyzing the items found. Literature is one of the essential sources to identify high quality adverse drug reaction (ADR) reports. Regulatory authorities require companies to monitor major international publications through databases, as well as local, non-English content sources in each of the countries where the drugs are marketed. In November, 2018, Embase introduced the first non-English content – French Local Language Module, which is designed to screen, review and monitor French literature for pharmacovigilance. Iveta Petrova holds a Ph.D. from Leiden University for research done on Wnt signaling in the nervous system. She joined the Embase team at Elsevier as part of the Content quality department. For 2 years she was responsible for writing and updating the indexing guidelines, as well as monitoring the quality of indexing. One year ago she joined the Product management team of Embase. Currently her tasks include continuous engagement with customers and market research to further improve and develop tools to support them in their daily responsibilities, specifically the enhancement of evidence-based medicine, pharmacovigilance and medical device clinical evaluation and safety. Please note: change of date! In this webinar, Julie Glanville , Associate Director at York Health Economics Consortium, will discuss literature searching in Health Economics. Health economics evidence is a key element in much health services research and particularly in health technology assessments. Health economic models are increasingly used to assist with health care decision making. Identifying economic evidence to inform such research can involve searches in a range of databases and using a variety of strategies. This webinar will summarize the key resources which can be searched to identify health economics information including economic evaluations and economic models. We will also explore how to design search strategies to find economic evaluations including economic models. With the closure of key economic evaluation databases (NHS EED and HEED) we will be focusing on how to identify economic evaluations from major bibliographic databases. Julie Glanville is Associate Director at York Health Economics Consortium, part of the University of York. Here, she manages systematic review and literature review projects. She also organizes the YHEC training programme. YHEC provides a range of research services including literature searches and evidence identification to inform research projects in healthcare topics but also in other fields such as food safety and feed safety, social care, housing, criminal justice and education. YHEC contributes to the evidence base for information retrieval with a special focus on identifying economic evidence and search filters (strategies) for a range of research methods. YHEC carries out systematic and non-systematic reviews for a range of clients to identify the effects of drugs, devices and other interventions. The training program also partners with Quantics Consulting to provide indirect treatment comparisons (ITCs) and mixed treatment comparisons (MTCs). Literature is one of the essential sources to identify high quality ADR reports. Regulatory authorities require companies to monitor major international publications through databases, as well as local, non-English content sources in each of the countries where the drugs are marketed. Currently, the local, non-English content sources is not available in most international literature databases, therefore screening, reviewing and monitoring this type of literature costs extra time, money and creates an additional compliance risk. Databases of peer-reviewed biomedical literature and regulatory documents are crucial sources for pharmacovigilance activities. When monitored properly, they yield drug safety signals that are essential for risk–benefit assessments and adverse event reports. However, both are vast resources that can be challenging to monitor efficiently and accurately, especially if different interfaces are needed to access each database. In 2018, Elsevier is enhancing key solutions for pharmaceutical R&D as part of ongoing efforts to improve the comprehensiveness, efficiency, accuracy and compliance of pharmacovigilance-focused research. By ensuring that all relevant information is captured efficiently, the company is helping drug safety and pharmacovigilance teams deliver considerable improvements in health-critical workflows. - Even more flexible means to run and oversee GxP-compliant workflows through QUOSA PV, with new functionalities for medical review, signal management and quality assurance. The webinar will address these solutions and enhancements in the context of comprehensive support for the goals of pharmacovigilance. Dr Su Golder is a qualified information specialist with over 20 years' experience. She has worked in lots of different settings and has a wide breadth of experience in supporting systematic reviews of healthcare interventions. She has specialist expertise in systematic review methodology and systematic reviews of adverse effects and has taught in this field. Her PhD on optimising the retrieval of adverse effects data was funded by the MRC and has made an important contribution to the retrieval of information on adverse effects both nationally and internationally. Her current research is on the use of unpublished data, text mining and social media to maximise the efficiency and effectiveness of the retrieval of adverse effects data and has been funded by the National Institute for Health Research (NIHR) and began in January 2015 on a part-time basis. Laboratory scientists face many practical challenges in implementing a desired chemical synthesis. One major challenge is the ability to access accurate information on what starting materials are available in a company’s local inventory, as well as which suppliers may be used to purchase desired chemicals. Once materials are identified, how long will it take to get them? What is the company’s negotiated price for each material? Besides being clever scientists, medicinal chemists must be master logistics planners coordinating all the materials and documentation necessary to perform chemical synthesis on an ongoing basis. Elsevier understands the chemist’s synthetic work flow and has taken steps with Reaxys to enable integration with local chemical inventory and purchasing systems. - How your procurement system can be integrated with Reaxys to make this process easier while saving the organization time and money. - How additional data from your systems can be integrated with Reaxys to improve workflows and accelerate discovery. The practice of evidence-based medicine (EBM) requires retrieving the knowledge from ever-increasing volume of literature. Librarians have supported EBM by offering information searching skills and various tailored training programs. While users’ needs constantly drive library’s teaching activities, customizable EBM teaching modules have been developed to respond to different needs of library's constituencies, particularly the policy makers within a university’s healthcare system. This involvement creates a new avenue to convey library’s value. Maylene is responsible for developing and providing systematic review services for the patrons principally from the health sciences schools at UPenn and the UPenn Healthcare System. She also serves as the Clinical Liaison Librarian promoting evidence-based medicine information resources and services. Before coming to Penn, Maylene was Clinical Reference Librarian at Quillen College of Medicine Library at East Tennessee State University, where she provided services for the clinicians at the Point-of-Care. Prior to the library field, she has 10-year experience in pharmaceutical science obtained from working in China, Japan, and Canada. In that career, she commercialized several products in nutrition and agriculture. She earned a B.S. in Pharmaceutical Science from the Nanjing University of Chinese Traditional Medicine, and an M.A. in the Library and Information Science from the University of Wisconsin – Madison. Search methods are part of the research methods in systematic reviews and evidence synthesis. Running a robust search requires following the existing evidence in selection of databases and search filters, addition of limitations, and inclusion of a search methodologist in your team. While a proper evidence-based search protocol could reduce waste and increase value in systematic reviewing, proper reporting should make your search a piece of science. The search methods should be reported in a way that anyone who have access to the databases could repeat the search strategies and search methods (reproducibility) and retrieve the same or very similar search results both in terms of content and numbers (replicability). Following the minimum requirement for reporting the search, the team could produce an evidence-based search method that could be re-used by the readers. The team could also share the search results, as part of their research data, to prevent duplicate efforts for the researchers who want to update the review. Farhad Shokraneh studied Medical Library and Information Science for seven years and was a clinical librarian in an emergency department for a short time. He worked as a research fellow in Research Center for Pharmaceutical Nanotechnology for two years. Farhad later joined Cochrane Schizophrenia Group in University of Nottingham to manage the largest database of schizophrenia trials and to update over 320 Cochrane reviews. He is also a volunteer with 14 Cochrane groups. He ran his first systematic review search in 2004 and continued providing search and consultancy services to academic, clinical and policy making teams around the world for over 2,000 grant applications, clinical trials, economic evaluations, rapid reviews, scoping reviews, umbrella reviews, systematic reviews, overviews, health technology assessments, and clinical practice guidelines. Embase wouldn’t be Embase without Emtree, the life science thesaurus is a hierarchically structured, controlled vocabulary, for Biomedicine and related Life Sciences, providing a consistent description for Embase indexing. - For database users, it facilitates comprehensive searching and high precision retrieval. Emtree has been used to index Embase (including Embase Classic) since 1947, and is unrivalled in its coverage of drug and medical terminology. Josephine Zimmermann holds a PhD in Molecular and Structural Chemistry and Physics from University of Grenoble for her research on the synthesis of fluorescent core-shell nanoparticles for medical imaging. Since two years, she works as Customer Care Representative at Elsevier and supports Embase as well as other Life Science Products. She is reporting the voice of the customer by collaborating closely with the Embase team, analyzing tendencies, providing feedback, and helping you with any kind of issues. Scientific literature is one of the largest source of adverse event reports, making it an essential part of pharmacovigilance. Marketing authorization holders are expected to perform systematic literature searches using reference databases and local journals from countries where the medicinal product has a marketing authorization. The retrieved information needs to be collated, analyzed, and communicated at least once a week. However, several challenges are associated with this process. Large amounts of data from various sources, various regulatory requirements, building and maintaining search strategies increase the complexity of literature searches. In this webinar, Scientific Information Expert Dr. Jean-Dominique Pierret will give a brief overview of regulatory obligations and usefulness of literature in the drug development process. And then he will introduce how he set up literature search for pharmacovigilance: such as selecting the databases, building the strategy with a focus on early detection of safety issue and benefit/risk assessment. Finally, he will give examples of challenges that may occur during literature search for pharmacovigilance. Dr. Jean-Dominique Pierret is a Scientific Information Expert and he spent +20 years in the pharmaceutical industry. He is currently working for Galderma R&D. With a strong background in information sciences applied to the biomedical domain, he is involved in the management of a corporate scientific library, in competitive intelligence and in information retrieval. Jean-Dominique is in charge for years of the literature survey for pharmacovigilance. Medical affairs teams need quick direct access to the latest literature so they can rapidly respond to client inquiries from anywhere. Embase has unique and comprehensive journal and conference coverage, in-depth indexing that makes it easy to find answers and customizable e-mail alerts that send out regular updates to automate the retrieval of information. Embase specialized capabilities ensure not only comprehensive retrieval of relevant information, but also that it is done in an easy and fast way saving time and money. Iveta Petrova holds a Ph.D. from Leiden University for research done on Wnt signaling in the nervous system. For the last three years, she is part of the Embase team. 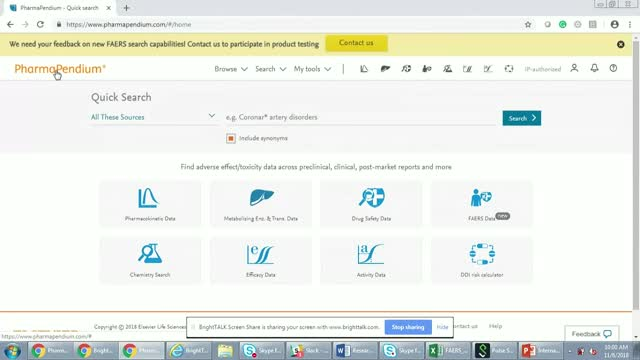 Main focus is addressing specific use cases of Medical Affairs professionals by leveraging the capabilities and peer-reviewed enhanced content of the biomedical database Embase, as well as continuous engagement with customers and market research to further improve and develop tools to support them in their daily responsibilities. Pharmacokinetic information from FDA and EMA regulatory documents informs translational and clinical development decisions and may lead to more successful drug development and regulatory approval strategies. In this webinar, we will discuss how to leverage comparative pharmacokinetic information from FDA and EMA Drug Approval documents to make better-informed decisions on which drugs have the most potential to succeed in clinical development. Title: What's new in PharmaPendium?